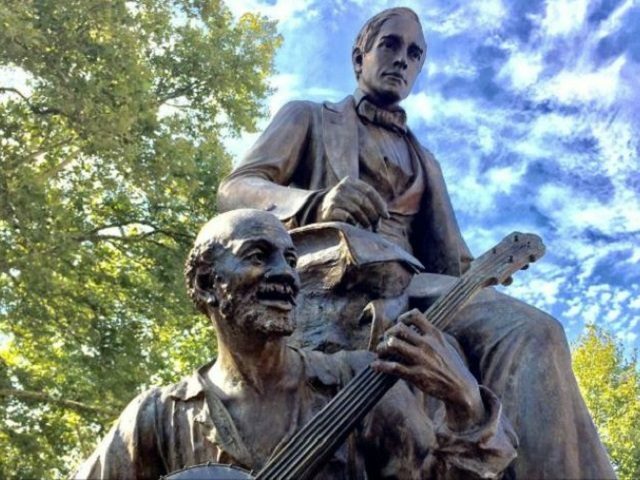 Stephen Foster, known as the father of American music, composed such classic pieces as “Oh, Susanna,” “My Old Kentucky Home,” and “Camptown Races” and was honored with the placement of a 10-foot high bronze statue in a Pittsburgh park over a century ago. Because the statue also depicted an African American man playing a banjo “at Foster’s feet,” it has been denounced as racist by certain social agitators in more recent years. The unceremonious dawn removal of the statue Thursday is the latest episode in a systematic purgation of American monuments that are thought to offend modern sensibilities, especially relating to race. Because of its portrayal of a fictional slave referred to as “Uncle Ned,” the statue has met the same fate as others honoring Robert E. Lee, Stonewall Jackson, and William McKinley. Last October, the Pittsburgh Art Commission voted to remove the 118-year-old sculpture from Schenley Plaza, and on Thursday, workers hoisted the statue off its base, strapped it to a flatbed truck, and hauled it off to a storage lot, away from the public eye. Local institutions, such as the University of Pittsburgh and Carnegie Museums, reportedly declined an offer last fall to provide a new home for the statue, which has now become politically tainted. Italian emigré Giuseppe Moretti sculpted the monument, which was first erected in Highland Park in 1900 and moved in 1944 to its location in a grassy area near the Carnegie Museums of Art and Natural History. Critics have been vocal in their condemnation of the statue. Yet W.E.B. DuBois, a black writer and civil-rights activist, praised Foster’s music, and one of Foster’s closest friends, Charles Shiras, was a well-known abolitionist. Deane Root, director of Pitt’s Center for American Music, said that Foster’s musical relationship to African-Americans is complicated. “He was the first songwriter to put enslaved people into his songs — texts that made them much less a caricature,” Mr. Root said. One historian, writing in the Pittsburgh Post-Gazette, has defended the statue as subtly anti-slavery in its message, while warning against overly aggressive attacks on U.S. history.